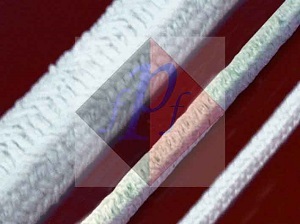 Ceramic Fiber Braided rope is produced by high quality refractory ceramic fiber and woven from yarn. It can be used for high temperature applications up to1050°C. The cloth is reinforced with fiberglass filament, and optional SUS304 wire (Inconel/alloy steel wire). Or even short working temperature could be reached to 1260°C. It has good resistance to acid corrosion, resistant aluminum, zinc and other molten metal erosion. Ceramic Fiber Braided rope (Packing) is produced by high quality refractory ceramic fiber and woven from yarn. It can be used for high temperature applications up to1050°C. The cloth is reinforced with fiberglass filament, and optional SUS304 wire (Inconel/alloy steel wire). Or even short working temperature could be reached to 1260°C. It has good resistance to acid corrosion, resistant aluminum, zinc and other molten metal erosion. 1. High temperature resistance and chemical corrosion resistance. 3. Low thermal conductivity, low heat storage and thermal shock resistance.